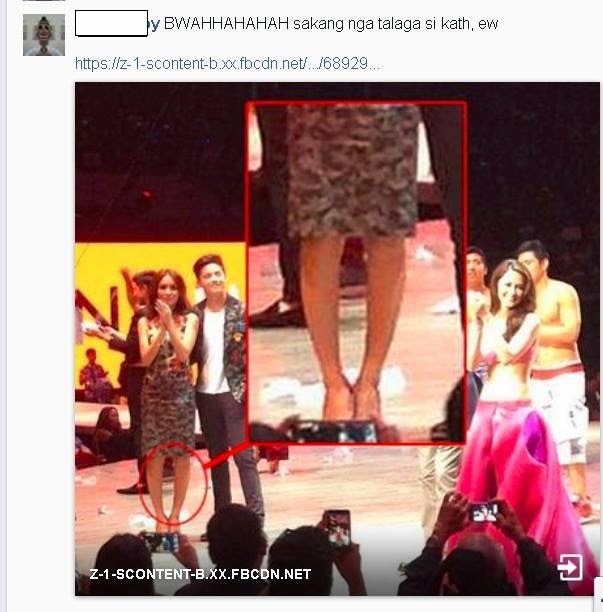 MANILA – Kathryn Bernardo’s pictures captured from BENCH ‘The Naked Truth’ fashion show last night slammed by netizens and dubbed her as “SAKANG QUEEN” because of her legs’ “toe out” structure. Here are some of the negative comments we gathered from various posts on Kahtryn Bernardo’s official fan page. Those comments all pertain to Bernardo’s leg structure. Some of them act as haters while others put in their comments as if this is the first time they’ve noticed it. The last comment that we included even misspelled the “tow out”, this should be toe out. But, because Kathryn Bernardo is really famous and earned respect of the people out there (especially the fans), they came out to save her from the bashing and commented back to defend her from critics. Kathryn’s fans enraged to get off the bashers in the comment section and protect her from them. They said Kath is still beautiful, gorgeous, and unique even if she has a toe-out (sakang) leg structure. In this video, Daniel is holding Kathryn’s hand while walking on the stage. People always have something to point out, and this time it’s Daniel. They say he’s dragging Kath too fast, and numerous other comments with the same thought poured in. What can you say about this “Sakang Queen” issue? Let us know by commenting below.